Well, I have been using pixelpost now for quite some time and liked it a lot. A few day ago i came across Lightbox JS v2.0 and wondered why I haven’t seen it before on any websites. So I wanted to combine both for the “Browse View” of my pixelpost. Before i continue with the install instructions you should have a look at it. Example. Ok now what to do: At first I am assuming that you have Pixelpost 1.5 already installed. Now get Lightbox JS v2.0 and copy the folders “css” and “js” just aside your “index.php” from pixelpost and copy the stuff from the “image” folder into the existing “image” folder from pixelpost. This entry was posted on Monday, August 14th, 2006 at 2:12 pm	and is filed under reviews. You can follow any responses to this entry through the RSS 2.0 feed. You can leave a response, or trackback from your own site. Might there be a mistake in the code you’ve indicated on your site? ich kriege den script einfach nicht zum Laufen…. der parser fehler wurde behoben. ich habe eine frische pixelpost version 1.5 auf meinen server gespielt. die script-änderung für browser_template.html, ist das die file im ‘templates/simple’ folder? This tutorial worked great! Thank you very much! Sidney, I don’t speak a lick of German, but from what I can make out…the location of the browse_template.html is in the templates area of pixelpost on your server. If you are using the Simple template, then it would be in ../templates/simple. 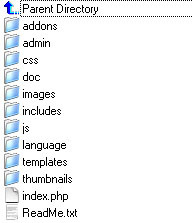 If you are using a different template, it would be in that templates sub-folder of the templates directory. Hope that helps and doesn’t cause further confusion. I’ve been searching for a tutorial how to implement this but can’t find how to do this. An other question, would it be able to use mouseover navigation like on your image_template and the zoom function like on your browse_template at the same time? E.g. Mouse left of picture is previous, mous middle of picture is zoom, mouse right of picture is next? A lot of questions, but I would be glad of you could answer my first one. I tried this but my images open in a blank window, not in the lightbox. I copied the code and the instructions and followed them to the letter. Do you know why this might be happening? sometimes the .js script takes a while to load. or you placed em in the wrong folder. I was also wondering why Lightbox was never implemented (even as a plugin) in Pixelpost. could you tell me where i can download pixelcandy template ? Hey! Thanks for this great tutorial! But I’ve one problem/question. It seems to me as if you use the mosaic-addon for pixelpost, is that correct? I’m using it too, but i’m not able to configure it the right way, because if i delete the showimage.php?=pieces code with images/$names no image is shown, but a blank page opens. 2. In “browser_template.html”, you have to post this code: . The difference is that the original code have “xref” and “xsrc” instead of “ref” and “src”. 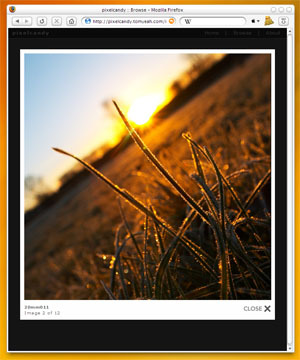 I didn’t found the “Element.show(‘caption’);” in “lightbox.js” bur it works great for me. This tutorial was just what I needed. I now have lightbox2 working on my pixelpost install! hi, i’m trying to get this to work with pixelpost 1.7 but after installing the code in the appropriate places, it still loads the pics from browse in the image page… i don’t get it.